"Dr. Avisheh is extremely professional and very thorough." "I found her to be very thorough, I had her undivided attention." "She is kind and compassionate, she addresses every question and listens attentively." "I highly recommend Dr. Forouzesh. I am very thankful for her accurate diagnosis." Avisheh Forouzesh, MD, is double board certified in both internal medicine and infectious diseases. She practices a proactive approach to care, going above and beyond for her patients at Advanced Infectious Disease Medical in Hoboken, New Jersey. Dr. Forouzesh is highly experienced and fellowship-trained in treating a wide variety of infectious diseases and internal medicine conditions. She’s devoted to providing a comprehensive, patient-centered approach to medical care, focusing on the long-term health of her patients. Dr. Forouzesh earned her medical degree from the SUNY Upstate Medical University at Syracuse and went on to complete her internal medicine residency at North Shore University Hospital. She completed her infectious disease fellowship training at New York Medical College in Valhalla, New York, where she developed vast experience treating all aspects of infectious disease conditions including post-transplant Infectious complications, tick-borne illnesses, HIV and HIV related complications, Tuberculosis, cellulitis and skin structure infections, pulmonary infections and complicated genitourinary infections, sepsis, and travel-related illnesses. She truly enjoys her profession and is diligent and very dedicated about finding the best treatment plans for her patients. In addition to her patient work at Advanced Infectious Disease Medical, Dr. Forouzesh remains active in education, teaching internal medicine, family practice, and podiatry residents at both Hoboken University Medical Center and Palisades Medical Center (Hackensack Meridian Health System) in North Bergen, New Jersey. She also served as chair for the Pharmacy and Therapeutics committee at Hoboken University Medical Center and is an active member of the Pharmacy and Therapeutics committee, currently at Palisades Medical Center. 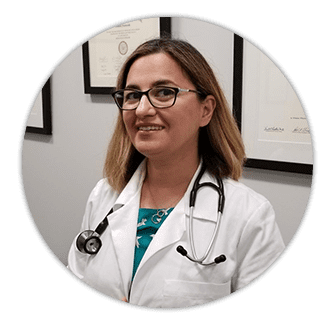 At her Hoboken practice, Dr. Forouzesh offers diagnostic and treatment services for a range of internal medical conditions and infectious diseases, including Lyme disease, HIV, pneumonia, and urinary tract infections. She is dedicated to spending ample time with her patients to get to the root of the issue, rather than just treating the symptoms. We participate in most commercial insurance plans including; BCBS, Anthem , Horizon BCBS of NJ, United healthcare, oxford, Cigna, Empire BCBS. The list is subject to change so please call our office prior to your appointment to make sure. please call our office for the most up-to-date information. It is recommended that you review your insurance plan for co-pays, deductibles and other benefit information prior to your office visit.